One of the most beloved knives in our collection is the GTC airborne SLT. A remarkable Gus T. Cecchini custom knife that is both beautiful to look, as well as mechanically unique. Our custom airborne sports inlays of Westinghouse micarta, and multiple finishes that can barely be believed. Then we heard that Zero Tolerance (ZT) was collaborating with Gus to make an airborne style model that included the SLT mechanism. Truthfully, we did not know whether to be thrilled or a bit aggravated. As a collector, you want to have something unique, and something that the hordes and masses can’t just attain without some serious pain in terms of time and money spent. 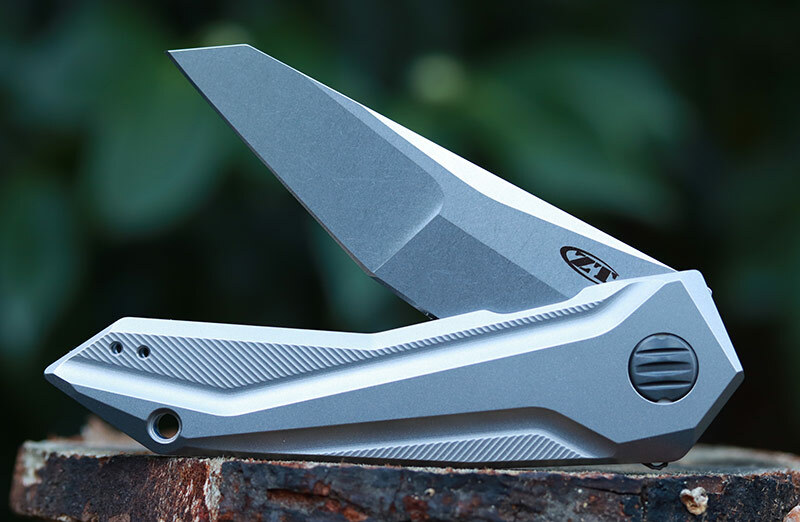 But at the same time, the knife enthusiast in us loved the idea that anyone willing to take a few hundred bucks out of the pocket might be able to enjoy a unique knife with a rare and superb flipper mechanism – Enter the Zero Tolerance GTC 0055. Gus T. Cecchini of GTC knives is no stranger to making the top tier, uber-high-end knives that command premium dollars. The airborne model became popular beyond just his reputation because of the SLT hidden flipper tab. This tab is concealed when the knife is closed and can be used when deploying the blade by pulling back on this Spring Loaded Tab (SLT) tab to activate the flipper mechanism. The tab once again completely disappears when the blade is open. With the ZT collaboration model 0055, the GTC Airborne takes the SLT mechanism, slightly modifies it, but keeps the lines, and general mechanics that make the Airborne so well regardes… or at least that is what ZT has claimed – Let’s find out! I was excited to compare the ZT 0055 model to our custom. When we received the ZT 0055 for the first time and unboxed it from the standard ZT packaging we were pleasantly surprised to see that the overall appearance of the knife looked about the same. Sure, perhaps some minor dimension changes, and no inlays or insane hollowed out compound grind with a mirror polish like on ours, but it was a cool looking knife. For those who have not seen an original airborne in person, the ZT GTC 0055 model is certainly unique looking. Some may love the look, others may find it odd. This model is certainly polarizing for certain. 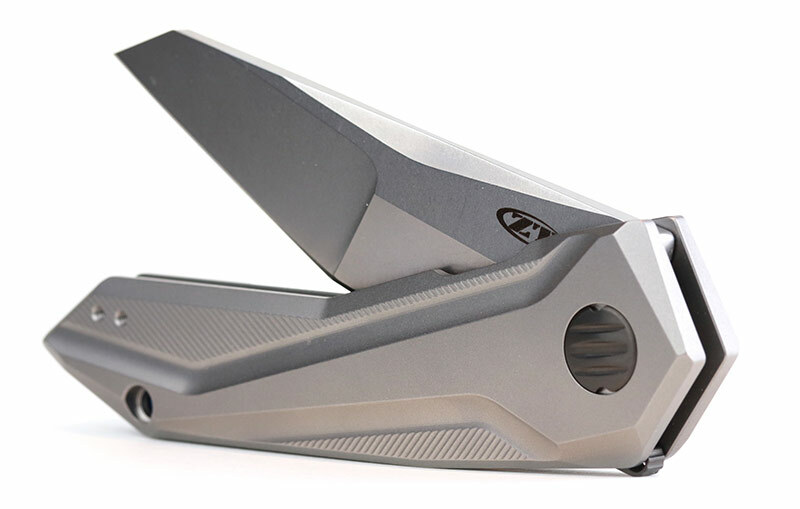 ZT used titanium on the handles, like the custom, but used machining techniques to create a grooved pattern on the handle scales. The 0055 includes a blue anodized back spacer, along with a black unique pivot screw that tries to capture some of the custom pivot screws appeal. It is a nice touch in our opinion, and makes the knife feel more expensive. Unlike the custom, the 0055 has a reverse pocket clip for those lefties who seldom get love from knife manufactures. More on the clip, the tip-up configuration will suite most enthusiasts just fine. We wish the clip was a 3D style clip, but the bent spring style does work more functionally. Overall, this is a very impressive effort from ZT, and it is no wonder why Gus was willing to collaborate with them to achieve this. The Airborne is not designed to be the most comfortable folder, or even the most usable. Sure, it will cut, as will the ZT 0055, but if function over form is your key factor, this is not the pocket knife for you. For sure you feel a sense of uniqueness but it’s not for everybody. With a 5-inch handle length, and 0.56” handle thickness, the knife is not small. It weighs in at 5 oz on the nose and has an overall length of 8.75 inches. Blade length is a bit smaller than the numbers might have foretold at about 3.75”. The first time we held the ZT 0055 we immediately recognized it as a GTC Airborne design by feel alone. Now for the more important part, the flipping and the SLT compared to the original – Well the ZT 0055 did flip well from the get go. We were very surprised how good the flipping felt. If you have never used an SLT flipper before, it is a very different feel, and requires a bit of getting used to. For us, we already had the experience, and the ZT 0055 delivered. One downside is that it’s loud. 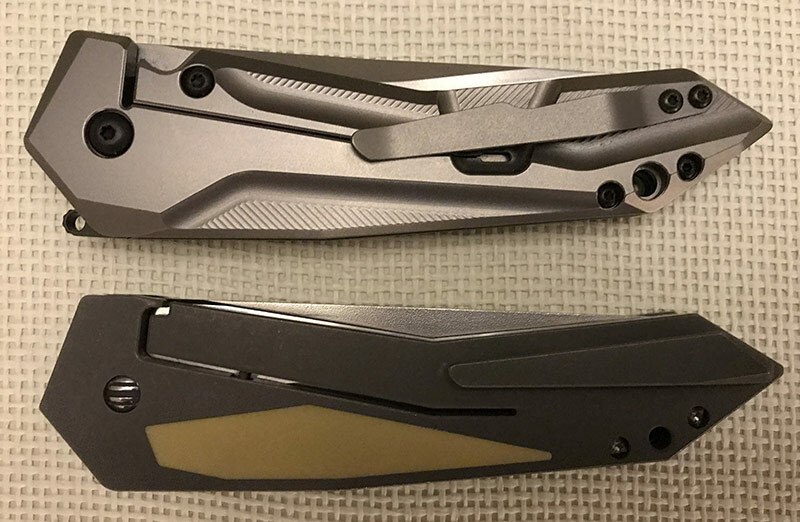 Though ZT chose to reveal the tab a bit more, keeping it further upward, and colored in black to that it can easily be seen, this did not really take away from the experience. The knife flips well. No, it is not as smooth as the custom, and no it is not as stealthy. But for one tenth the price (or less), it is extremely good. We flipped the 0055 at least 200 times for first day we got it. It is a very good feeling knife in hand, especially for flipping. Unfortunately, the same cannot be said for cutting as we describe later. For well over two months we have used the ZT 0055 as our primary large carry folder. During this time, we have grown to both love and hate the knife for very different reasons. We love the knife because it looks unique, sits reasonably well in the pocket, has a very usable pocket clip, and with its reverse tanto grind on the 3.75-inch S35VN blade can really pierce items when needed. What we dislike about the knife is the unconventional hand position and feel, lack of finger guard, loud opening, non-standard blade shape, and that it draws attention to itself when used in public. Not everything is black and white with this knife, or the results. Some days we would love the knife, and other times we wished we had something more traditional. For this, we feel that the quirky nature of the knife will suite those who are a bit outgoing, and perhaps willing to take some risks. To try and be more specific, let us take you through some tests we performed. We took the opportunity to test the ZT 0055 under somewhat unconventional means. These tests are designed to put the knife through limits greater than what might be common for must EDC users. However, some traditional testing was also performed. We always wanted to drive over something to see if it lives up to its hard use and rugged roots. 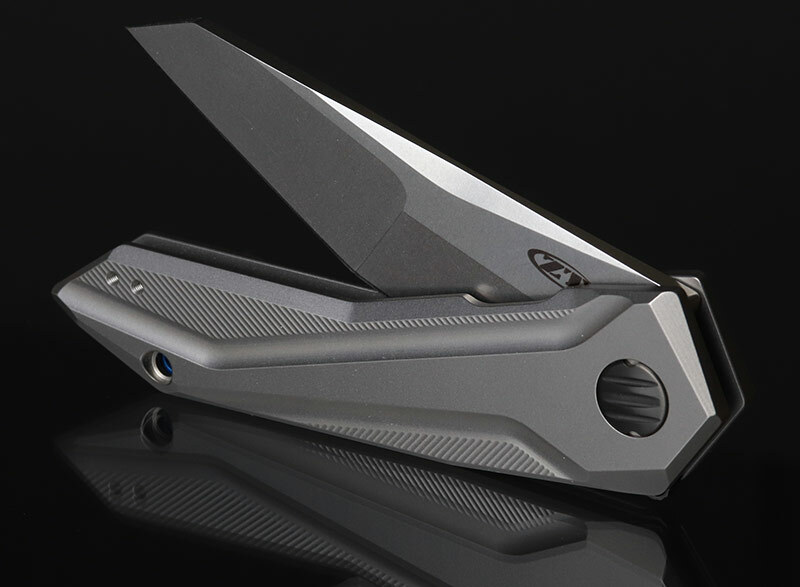 As a ZT, regardless of who initially designed it, the product should be able to take a beating and keep on going. So, to test this we placed the knife on our driveway and ran over it with the car. Oh and we did it again, and again, and again. The result? No major damage noted. I suppose this thing is made tough indeed. Certainly some reassurance that it’s built to last. Just for kicks, we left that knife on the driveway for 5 days… these days included sun, rain, and eventually snow. After five days we collected the knife from the driveway to see if mother nature could be more brutal than our 3500-pound SUV. In this case, we observed wetness and dirt and grime, but no observable rust or corrosion. The blade seemed just fine, and the handle and hardware did not seem bothered. Oh, did we mention that the blade was nicely centered out of box, and stayed centered without blade play after all our tests? For another test, we decided to find out less about the usage, and more about the usability for those not in the know. Specifically, we asked family, friends, and some co-workers to open the pocket knife. Interestingly, only 2 people out of about 20 succeeded in opening the knife. All others could not get the knife to deploy or were unable to determine how. What does this tell us… probably nothing, but it is interesting to know that if you leave it on the counter, chances are your wife or kid might not figure out how to open the ZT 0055. For better, for worse? You decide. We haven’t performed all too many cardboard cutting tests in the last few months, so we had a mound of boxes waiting for breakdown. Our addiction for online purchasing was evident as we had almost 25 boxes that needed some serious Zero Tolerance 0055 time. We carefully first tried to cut some down without gloves, and as expected the results were poor at best. Though the blade was able to puncture the corrugated board, we were unable to sustain a proper grip position with comfort and without slip. With gloves on the task became both easier and safer. The blade is very well suited with the reverse tanto and compound grind. It can puncture and cut well, but again even with gloves it was a bit of a challenge. Would be cut with this knife if we had to seriously breakdown items such as this again? We would likely say other better options exist that would make the ZT 0055 an observer for these types of tasks. The Zero Tolerance 0055 GTC collaboration can be purchased for about 200 dollars at most online retailers. We have even seen it as low as 150 dollars at one point in time. For that price, this knife is incredibly appealing. Further incentive of knowing it is made right here in the USA makes the value proposition even stronger. But price aside, how did we feel about the ZT 0055, and how did it compare to the GTC Airborne SLT which it was inspired by? Some perspective… it took us over 3 years to build up the funds, courage, wait-time, and brain-damage to shell out serious cash for our GTC custom. Sure, we love it, but for around 200 dollars you can have a similar experience at a fraction of the cost. We love that it is unique, and we love that it is usable as long as you are aware of the limits and limitations that the design brings forth with it. If you want to get a GTC custom from the perspective of a collector, the ZT will probably not best appeal to your taste. Unless of course you want a usable approximation of your safe-queen GTC airborne. This is likely the type of folder that will serve the style forward EDC’er really well. For occasional use as a large pocket knife, the Zero Tolerance 0055 delivers. So much so it made the list of our favorite ZT knives. A worthy collaboration and affordable version of the popular GTC Airborne custom. However, it's undoubtedly more appealing on the eyes than it is in function.